Burgers are a popular Aussie favourite. 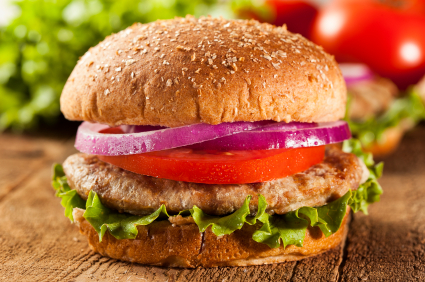 A healthy twist on a popular takeaway item, you will find these chicken burgers quick and tasty to make and serve. Cook on the barbeque for an authentic taste. Mix together mince, brown onion, bread crumbs and Moroccan seasoning. Beat eggs and add to chicken. Using clean hands shape the mixture into 4 patties. Lightly dust in flour. Heat a fry pan or barbeque plate to medium-high heat and lightly spray with oil. Cook each patty for 3-4 minutes on each side, until brown and fully cooked through. To prepare the sauce, mix together yoghurt and sweet chilli sauce. Cut rolls and fill with lettuce leaves, sliced red onion, tomato and cucumber. Add chicken patty and top with sauce. Replace fresh bread crumbs with ½ cup dried. Turkey mince may be used as a replacement for chicken mince.